Listen up, drummers! Do you covet the skills of Travis Barker, wish you could rock out like Chad Smith, or throw down the beat as well as David Grohl? Then keep reading…we have the secrets to help you get there! It should be no surprise that these drum talents didn’t develop their skills overnight…and sadly, neither will you. While it’s true that there are no shortcuts to success, there are ways to accelerate your drum skills and fasten the road to drummer hall of fame. Below are three super effective and easy ways to boost your drum playing in no time at all! You already know you need to practice if you truly want to improve your drum skills. But there’s practicing and then there’s the right way to practice. Practicing with intention, purpose, and a goal in mind is the key to progress and will maximize your time and effort. There are a few different ways to ensure you are truly practicing and improving and not just jamming out for fun. First off, set up a practice area for yourself; a designated space that is organized, comfortable, and inspires you. Next, try to establish a routine. It’s helpful to create a routine for yourself by practicing at the same time and day every week, which will help you keep yourself more accountable. Lastly, you should always practice with a goal in mind. By framing your practice session around a goal, you’ll instinctively push yourself harder and stay focused more easily. Some people also find it helpful to maintain a practice log to record the time and date they practiced as well as what was worked on and what areas still need attention. Having a structured plan of action will do wonders for your practice sessions and supercharge your efforts! The more techniques and advanced skills you master, the more your drum playing will improve. While there are a myriad of insider tips and tricks to amp up your playing, one in particular that we recommend is something called the heel-toe technique. This technique has gained popularity in the drumming community in the last few years and for good reason! It is a technique which allows you to play double strokes on the pedals, which makes it possible to play faster and with more precision. Here’s how to execute the technique: leave your toe on the pedalboard, quickly raise and lower your heel, striking the pedal with force (but not too much). This movement will naturally cause your heel to make contact with the pedal a second time. This is the easiest way to double tap the pedal…and the quickest! Mastering this technique will allow for more complex and rapid pedalwork, which will enhance your overall sound. Try playing along with a metronome to make sure you stay on beat. Or, for even more advanced players, set the metronome to a faster time and see if you can keep up! Pick out a song that you know is difficult and above your skill level, but learn to play it anyways. Yes, you won’t master it from the get go…but that’s the point! Slowly but surely your skills will grow the more time you spend working on the song. Try it and see for yourself! Wear ankle weights when practicing. While this will initially slow you down, it will eventually increase your speed as the muscles in your feet and legs develop over time. Finally, one of the most effective ways to beef up your skills and get better at playing the drums is by taking drum lessons. 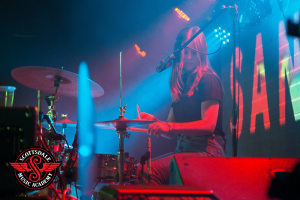 Think about it…drum lessons give you access to an experienced real-life drummer that’s been in your shoes before, and managed to make it to the other side! 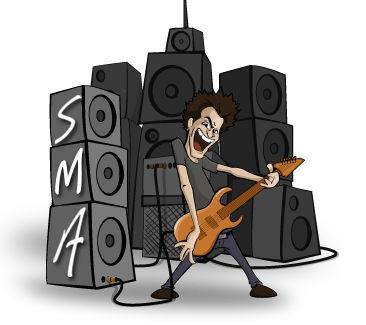 Drum lessons, like the ones SMA offers to Scottsdale, Phoenix, and Paradise Valley residents, are the best way to ensure all your practicing is really making a difference, and it’s a great way to spot what skills need improving. If you truly want to accelerate your drum playing and substantially improve your skills, sign up for drum lessons! 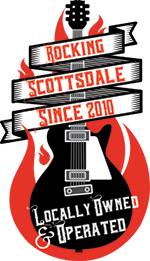 Call Scottsdale Music Academy to schedule a complimentary drum lesson today!